Examples of items people collect start here - Also see the A to Z of collectibles, click here. What has become truly amazing to the World Carrot Museum team is that once the site became firmly established with a web presence then what quickly followed was the connections with different people from all over the world who all have a passing interest in carrots or who are serious collectors. 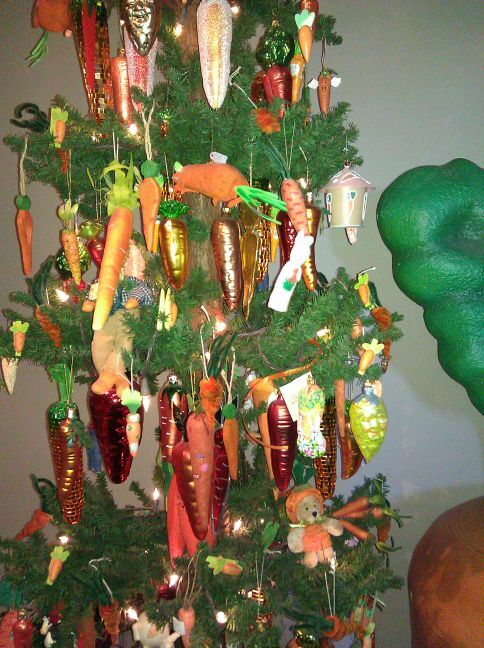 In most cases it can only be described as sheer carrot madness! The Museum staff thank the contributors for their efforts in making the site even more interesting and absorbing, both to write and read. There appears to be no end to "carrotabilia" which can be collected. Plates, teapots, pitchers, carrot scrapers, key rings, fridge magnets, corkscrews, knifes, badges, Christmas ornaments, jewellery etc etc. Click here to view some samples of items which people have collected once carrot madness takes hold. Picture, right, shows the Carrot Museum Curator and Keeper in one of the carrot costumes in the collection. This "disguise" is one of a kind. On a more unusual tangent there are people who have been carrot tattooed and those who collect carrot bags. Those who have dared to come forward have been allocated their own unique page in the World Carrot Museum and have become firm friends of the site. In fact quite a community of carrot maniacs has grown with e-mail, letters, parcels and exchanging pleasantries as we all exercise and exhibit our carrot madness in our own unique and special way. Pictured above (right) and below right, John the Carrot Museum Curator. Some of the collectors together at the 2015 Holtville Carrot Festival. Here is the carrot collectors listing. Each person has their own page with photos and full details of their collections. Click on the name below to read about the amazing collections. If you think you qualify for a listing please get in touch. "All contributions welcome". Romana, the Carrot Queen has the best Carrot Museum with her collection which has now over 1500 different carrot pieces and the collection is still growing! Romana runs the famous Armistead Cottage in Rhode Island where you can visit and stay in the Carrot Room. There's even items hanging from the ceiling. Here you will find a longer listing of the variety of items which people collect. Jeff Chiplis, the carrot bag collector extraordinaire from Cleveland, Ohio with over 10,000 items but a firm addict of carrot bags. Also a world famous neon artist. Zizi Fouquet, from California (also known as ZIZI CARROT) is a true carrot lady. Not only does she have a comprehensive collection of carrot memorabilia but is also festooned with carrot tattoos. More evidence of real carrot madness. By the way Zizi has also managed to produce an offspring with carrot top hair! 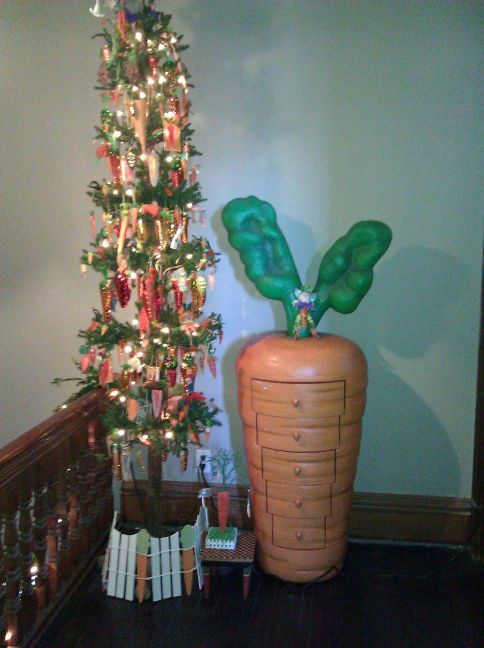 Barbara Gannon, from Cleveland, Ohio a proud collector since the 70's and declared December 10 as Carrot Day! Susan Johnson, from Missouri specialises in carrot plates and has even managed to dress up as a carrot. 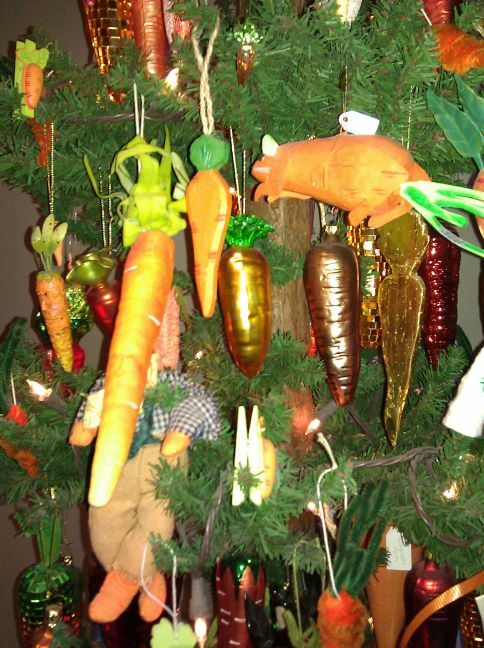 Caroline Hoyt, from Iowa is the proud owner of a brilliant set of carrot collectibles. It's easy to see the root of this admirable collection. She even has a carrot themed kitchen! Diana Kukk, from Virginia a relatively new collector and likes salt & pepper pots in particular. Jennifer, from South Carolina, another person in the carrot club with a tattoo! Elizabeth, from Texas, the latest recruit to the carrot collectors club. Sunshine, a long time collector with a penchant for plates. Kjell Arne Nordli from Norway is an avid carrot collector and the only one in Europe! check out the carrot guitar! Helen, from South Yorkshire, the first UK collector I have spotted. David Coulson, the second Carrot Bag Collector which has been uncovered. 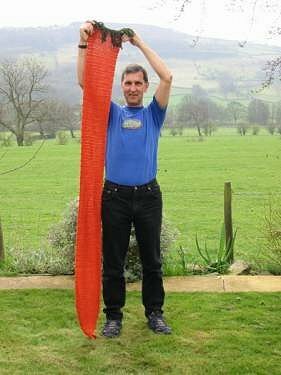 David, a graphic designer from Pittsburgh, PA has been collecting carrot bags since the late 70's. Patric Richardson - a carrot collector from St Paul MN (formerly of Lexington KY) having read the website for years finally decided to send a pic. Patric has hundreds of carroty items, but sadly lots of them are in storage. See also the Press Cuttings page, Carrot Museum's "Claim to Fame" - Click here.